Lynx manages all aspects of the compilation of the seismic archive, release of data, and client requests on behalf of the UKOGL Trustees and the UK Government. The UK Onshore Geophysical Library was established in 1994 in conjunction with the Department of Trade and Industry (now the Oil & Gas Authority (OGA)) and the UK Onshore Operators Group, as the formal governmental archive and release mechanism for landward seismic surveys as acquired by the UK Oil and Gas Exploration Industry. With 17 years direct experience, Lynx has a detailed working knowledge of the real-world requirements and issues to be addressed in order to establish a successful national seismic repository. Fostering close working relationships with data owners, storage contractors, clients and governmental bodies. Formulating effective approaches to allow companies to transfer their entire seismic data holdings into the Library archive. Effective management of public domain and proprietary data sources. Continual refinement of procedures for effective archive management, accounting, audit support and reporting. Lynx has a dedicated and loyal team of experienced staff to manage all aspects of the national archive, providing the UKOGL Trustees with a valued continuity of support. Long service of core personnel since the establishment of UKOGL. Call on wide range of disciplines including geophysicists and geologists. In-house IT development to formulate and implement new initiatives. Responsive administrative and accounts support team. Lynx has worked closely with governmental bodies in the UK to help implement administrative policies and procedures, ensuring the effective and legal transfer of all data to and from the Library archive. All procedures are rigorously adhered to, providing a comprehensive support backup for administrators and auditors. Official Data Request and Release Intent declarations. Formal Sign-Off documentation transferring the legal obligation to curate data from owners to the Library. Licence Agreement stipulating terms of data supply. Underpinning the entire archive has been the compilation of a master line navigation data set compiled from digital sources or captured from the digitising of base maps, providing a template for surveys to locate, archive and release. Lynx realises the importance of a complete pre- and post-stack archive in order to provide the maximum support to the Library's client base and takes pro-active measures to ensure that this is achieved. Seek authorisation to liase directly with storage contractors for effective data transfer and to independently interrogate database catalogues to help locate mis-referenced items. All surveys allocated unique tracking references with auto-generation of Production Sheets to handle each stage of data receipt, archive and supply. Archive held online and managed on 10TB RAID in parallel with secure offsite secondary and tertiary backups to DVD and tape. 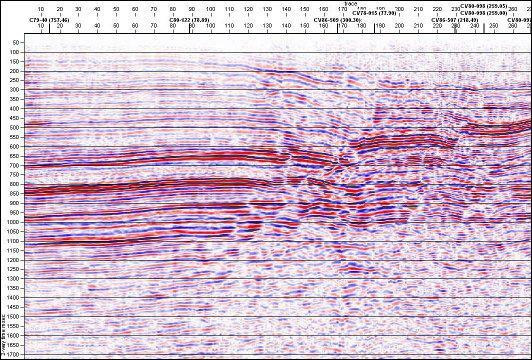 Lynx holds a detailed technical knowledge of all pre- and post-stack data items and has developed a comprehensive range of techniques to accommodate the verification and transcription of the extensive range of source formats related to seismic data. Source Observers Documents cross-referenced to ensure complete set of Field Tapes identified and retrieved. Transcription of SEG and non-standard internal formats into industry standard SEG-Y & SEG-D DMX. Digital check of decimated output file by trace or record to confirm reformatting. Cross reference of specified sample intervals, sample rates, number of channels and record ranges. Full reporting of missing or bad records and data integrity. Verified and reconciled data archive ready to supply for workstation loading. Seek all key supporting field documents including Observers Logs, Elevations, Static Sheets and Omissions to optimise value of source field data for reprocessing requests. All hard copy documents scanned as merged PDF files. CDP, Source and Receiver navigation manipulation and transcription including geodetic transformations. Tape transcription of original and reprocessed data sets ensuring correct sample rates, record lengths and ranges, from media including 9-track, exabyte and 3590. Wide expertise and extensive range of in-house tools to verify, plot and manipulate post-stack seismic trace data and location data. 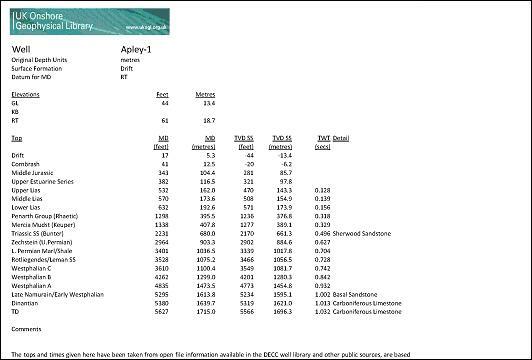 EBCIDIC C-Card header export and population. Full reconciliation with navigation data including SEG-Y trace header population and output to workstation formats where required. Large scale scanning capabilities to convert hard copy sections into high quality digital greyscale or colour images. Specialists in reconstruction and enhancement of hard copy sections (seismic vectorizing) into SEG-Y format where digital versions not previously available. Lynx has built a fully relational database, constructed specifically to effectively manage all aspects of the archive and sales. The database is spatially enabled and allows for information held to be dynamically tied in with a map based web portal utilised to promote the availability of data to commercial interests and academic institutions. Holds details of survey wide and line specific parameters including ownership. Provides forms for clear production methodology. Catalogues details of the final archive reflecting all items located and any observations encountered during the archive procedure. Detailed client request management including status and entitlements. In-built search facilities and hyperlinks. Companies and contacts tracking forms. Automated reporting summarising monthly activity, areas of interest, sales overview and outstanding work with associated costs. Utilising both industry-wide software and a range of bespoke tools specially designed by Lynx, we are able to provide a comprehensive solution for the successful verification and archive of all source data types. Equally, Lynx has been able to refine its hardware requirements and is able to provide recommendations on the optimum configuration. Licensing of Lynx LEASSV software for hard-copy seismic section conversion and digital post-stack processing. 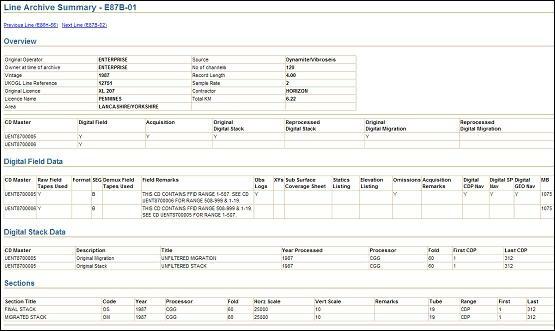 Licensing of Lynx LEA tools in support of data capture and manipulation. 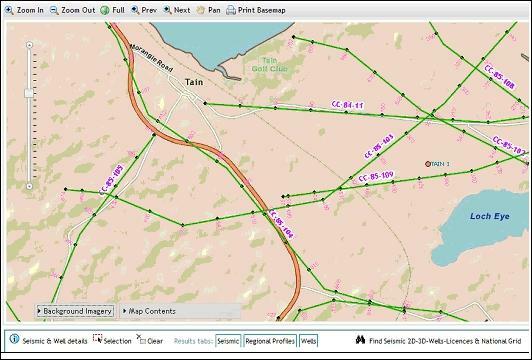 Lynx plug-ins for utilising seismic data in conjunction with digital mapping applications. In-house developers providing active support for new initiatives and effective response to required software modifications. Guidance with 3rd Party Software for major tape transcription work. Lynx is an ESRI UK Business Partner working with ESRI ArcGIS software to develop and host GIS data websites. Through this expertise Lynx has designed a fully integrated map-based web portal to provide a public interface for the Library archive. 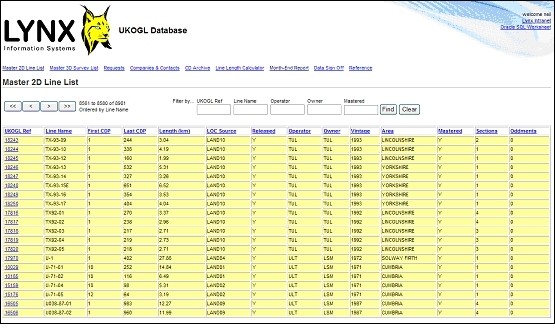 This website utilises ArcGIS Server to provide the interactive map front-end, and ArcSDE and Oracle Locator to provide the back-end data storage - click here to see the interactive UKOGL map. Interactive backdrops displaying satellite and aerial photography, street maps, topography and surface geology. 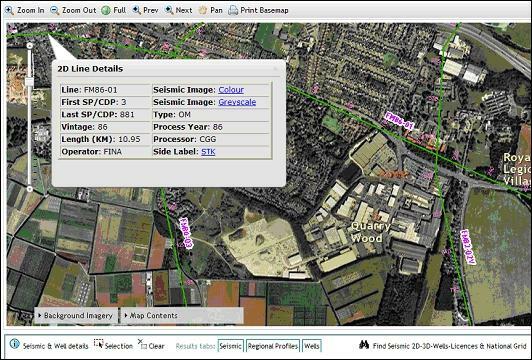 Fully searchable seismic coverage, licence block and well locations with auto zoom. 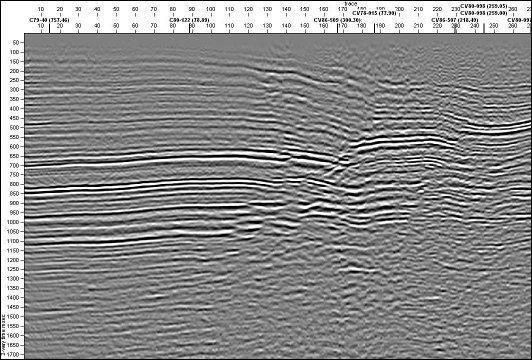 Hyperlinks to high quality images of seismic profiles and well tops sheets. Images and layer files for download. Selection exports for reports and data requests. Lynx has provided active support to the Library in managing requests from an extensive range of companies and organisations active onshore in the UK. Interests supported have included Oil & Gas Exploration, Gas Storage, Mining Assessments, Coal Bed Methane & Shale Gas Extraction, Water Resources, Environmental Issues, Planning & Engineering and Academic Research & Teaching. In conjunction with the database, Lynx have developed a set of procedures and methodologies to deal efficiently with the wide variety of requests from the archive. Data categorisation and nominal coding for effective accounts support and audit control. The Library has been hailed as a major achievement within the UK and a stimulus to new interest and activity. In active support of new exploration initiatives and academic research, it has transformed a situation where data was previously difficult to obtain, to one where a valuable reconciled and archived national resource can easily be accessed by all. Lynx has played a significant role in establishing the blueprint for the optimum archive and through the dedication and professionalism of its staff has helped to ensure the continued success of the Library. Lynx take great pride in what has been jointly achieved with the UKOGL Trustees on behalf of the UK Government and are confident that the Library structure offers a portable model for the effective archive and release of data. Contact the UKOGL Trustees for references. 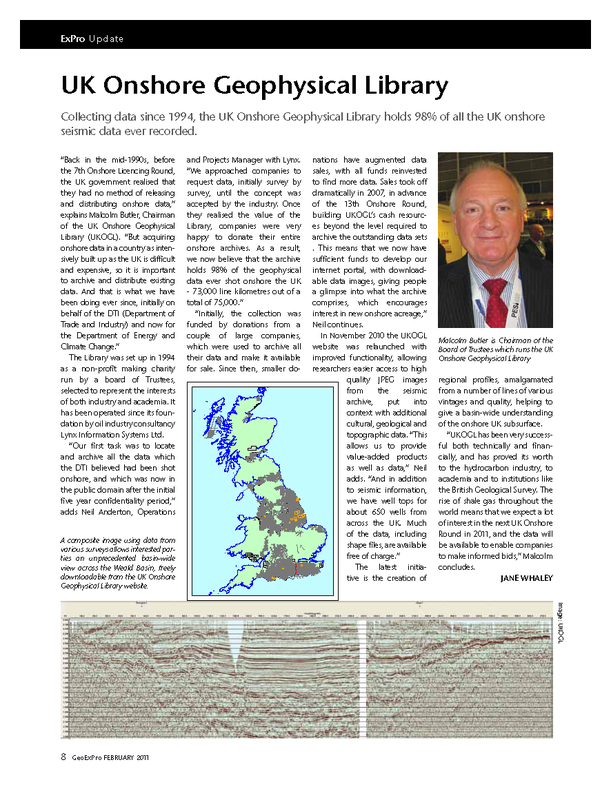 Geo ExPro article February 2011 - UK Onshore Geophysical Library.